to provide a natural, holistic range of premium products which can enhance hygiene, health and daily living. Argan Conditioner combines nature's most operative and effective conditioning agents for the best all-in-one hair care treatment safe and sustainable for all hair types. Helps with dryness, bed head, volume, frizziness, curly hair, brittle hair, knots, static reduction, and smoothing, all while gently conditioning delicate hair to result in tender, shiny, and easy-to-manage hair. 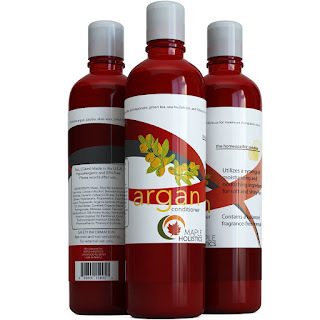 Argan Conditioner is also safe for color treated hair (sulfate free). Compatibile with all shampoos and most hair treatments. Maple Holistics Argan Oil Shampoo & Conditioner are amazing! The Morrocan Argan Oil used in Maple Holistics Argan Oil Shampoo & Conditioner's formula is of the highest quality; cold-pressed, undiluted and straight from Morocco. After using this shampoo and conditioner just one time I noticed my hair felt thicker and stronger. When I dried it, it was less frizzy than normal and looked mousturized and healthy. My hair continues to look healthier with each use and I'm extremely impressed that Maple Holistics Argan Oil Shampoo & Conditioner is silicone free, sulfate free, fragrance free, paraben free, and contains no artifical colors or harmful ingredients. 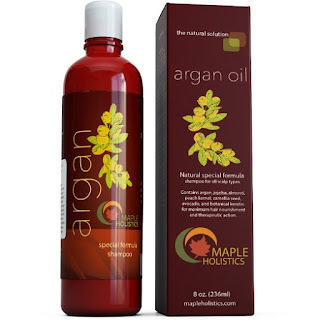 Maple Holistics Argan Oil Shampoo & Conditioner are incredible and I highly recommend them! To learn more about Maple Holistics click HERE! Follow Maple Holistics on social media!